There’s really no secret that if you want to have a fantastic Internet marketing strategy for your business then you need to focus on your customers. Great online marketing does not depend on which channels you are on, how long your blog posts are, or even how well your website is structured. Sure, these elements matter in the long-term success of your marketing strategy, but when in the end these are small considerations for your business. The most critical factor for your online marketing strategy is whether your business is addressing the needs of your customers. Nothing matters more than a customer-driven online content strategy. Your business needs to know who your customers are, what their needs are, and what they are looking to accomplish. Once you see this information, you will be able to develop a fantastic content strategy and help drive qualified leads to your site. Search Engine Optimization (SEO) used to a technical specialty that focused more on tricking algorithms than delivering great content to customers. However, Google employs thousands of engineers and psychologists that work together to tweak the search engine in ways to provide more relevant content based on search queries. This means that as you optimize your content to get found by Google, you need to also focus on developing great content for your audience. Leveraging different types of content like blogging, YouTube, and email offers great ways to answer questions and address the needs of your customers. SEO still matters because you need to get your content found, but getting noticed online should not be your ultimate goal. This is because Google doesn’t pay you money for ranking first in your industry- it is your customers who exchange their money for your goods and services. This means that you need to focus on the needs of your customers and entice them to engage your business and give you their money by gaining their trust with amazing online content. One of the best ways to ensure your content gets found online is by understanding how they search for their solutions. I like to write down the needs and questions that people often ask when looking for a product, and then provide keywords that match those issues, and align those questions and answers with specific pages on my site. Many business owners think they need to produce massive amounts of content to keep up with their industry. However, the truth is that your competitors likely invest thousands or millions of dollars each year in SEO and content production, so you are behind the mark in quantity. Instead of worrying about the amount of content you produce, you should first think about the quality of content for your ideal customer. This means thinking through the needs of your customers and delivering great content that will get found on search engines and social networks, while also building an audience. Now, don’t get me wrong. If you only produce one blog post a month, you will likely not rank well or see many results. This is same on YouTube and other social networks because platforms like YouTube and Facebook depend (and reward) content producers who publish content on a regular basis. Now that we have discussed optimizing content for Google and writing quality content, you should also consider who you are writing for. It is pretty easy to rank keywords that have lower competition in any industry. Writing content that focuses on a primary and secondary keyword in each blog post, and interlinking each blog post to one of your main service pages means your site will rank quickly. Add to that strategy some quality backlinks and social signals, and your content will begin to rank in search engines. Will this content address the problems of my audience? Would I still write this content, even if I knew it would not get picked up by search engines? Will this content be so helpful that my audience will share with their friends? Great content blends the worlds of technical SEO with the human-focus to improve content marketing for your business. While your content needs to be optimized to get found on Google, it also needs to be tuned to engage your customers. Social media is a place your customers go to when they are bored, so this means your company can reach your ideal audience at times when they are not actively looking for content. While this sounds like it might hurt your ability to reach your audience, in reality, since your customers are relaxed as they search social media you can develop content around their needs at this time. Another reason your business should think about leveraging social media for your marketing strategy is that everyone has a social media account. While Facebook is the most extensive social network, you can also create content for other social media platforms. The social system you use and content you develop depends on who your audience is and your business goals. The SEO community is also noticing a shift for many users from using Google as their go-to source of information, and many customers are going to social media to research future purchases. Instead of searching on Google, many people in the buying stage look to social media to find social proof and ask their friends about the buying decision. Your business can leverage the evolving online market by putting more time and resources into securing a dominant position in your social network of choice. While social networks are not an alternative to Google at this time, you should begin to future-proof your business is by focusing on social media marketing. Evergreen content is the most valuable content that your company can produce because this content will not expire or become outdated. Evergreen content helps secure a high position in search engine ranking because this type of content addresses basic needs of your audience and since it is relevant for a long time it will get the attention of various signals in Google. Event-based content like information about Christmas gifts is only relevant at specific times of the year. While this content is an excellent approach to seasonal SEO, evergreen content is appropriate at all times of the year. If you want to level out a constant flow of quality traffic, then you should focus your content production on evergreen content. 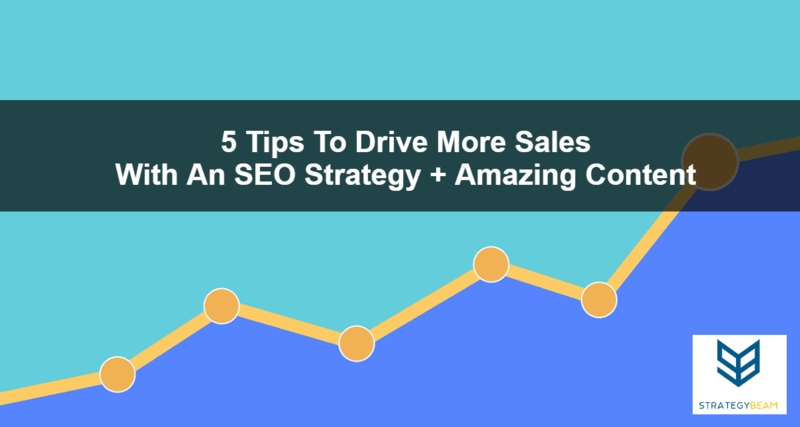 Now that you have read the top suggestions to help build your SEO strategy around amazing content, your business should work on different ways to drive qualified traffic to your website today! If you want to focus on growing your business, you should consider hiring a marketing professional to handle all the marketing and content production for you. Stop worrying about content and start making more money.